The annual National Association of Broadcasters Convention is usually a good place to find the latest in cutting edge storage solutions, designed to handle extremely demanding workflows like 6K video, and this year's event didn't disappoint with both LaCie and Promise introducing RAID solutions supporting Thunderbolt 3. 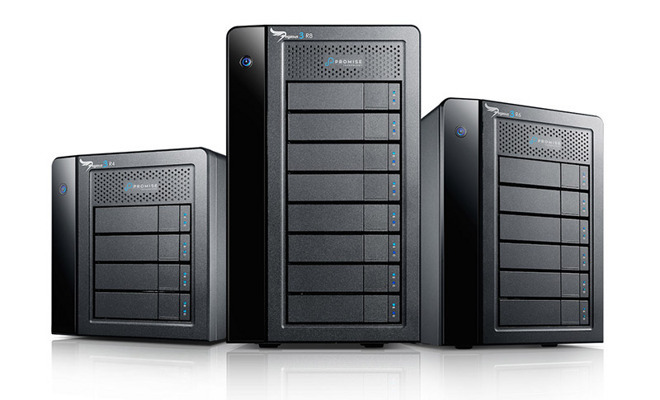 Hogging the limelight this year was a massive 12-bay RAID unit from Seagate subsidiary LaCie. Following with the firm's on-the-nose naming convention, the 12big Thunderbolt 3 features enterprise-class drives and a RAID 5/6 controller capable of serving up to 96 terabytes of data at speeds reaching 2,600 megabytes per second. All this power is squeezed into a tower style setup footprint the company claims takes up less space than a typical laptop. Offering a sense of scale, LaCie says the 12big can store 100 hours of 4K ProRes 444 XQ footage in a RAID 5 arrangement. And thanks to the unparalleled bandwidth offered by Thunderbolt 3, users are able to edit multiple streams of ProRes 422 (HQ), ProRes 444 XQ and uncompressed HD 10-bit and 12-bit video. the 12big also features two Thunderbolt 3 ports and one USB 3.1 port with support for daisy chaining multiple 4K displays and powering external hardware. "LaCie is committed to helping video professionals master ever-increasing data demands by ensuring their irreplaceable data is secure, available on demand and always driving value," said Tim Bucher, Senior Vice President of Seagate and LaCie Branded Solutions, "We purpose-built the LaCie 12big to have the speed, capacity and reliability to efficiently download and edit even the most demanding content--so our customers can focus on making their creative vision a reality." On the software side, LaCie includes its redesigned RAID Manager to help users set up disks, manage RAID settings and monitor storage assets. The application includes setup wizards for creating and managing custom volumes, while manual controls let users customize CPU settings, auto rebuild options and access diagnostics tools. The LaCie 12big Thunderbolt 3 is expected to ship this summer in 48TB, 72TB and 96TB configurations. Pricing has not yet been announced. Promise Technology revealed its next-generation device lineup at NAB on Monday with the announcement of Pegasus3, a selection of Thunderbolt 3-equipped multi-bay storage systems built to meet the demands of professional users. Like the LaCie model, Pegasus3 is built around the speedy Thunderbolt 3 standard and comes in 4-bay, 6-bay and 8-bay configurations, dubbed R4, R6 and R8, respectively. In addition to two Thunderbolt 3 ports, Promise opted to include a DisplayPort connection to support an external display without requiring breakout box. In addition to its RAID products, Promise introduced the new SANLink3 16G Fiber Channel interface and SANLink3 NBASE-T Ethernet interface. The SANLink3 line allows users to interface Thunderbolt 3 equipment with an existing Ethernet or Fibre Channel infrastructure to achieve transfer speeds of 2.5Gbps, 5Gbps or 10Gbps, depending on model. 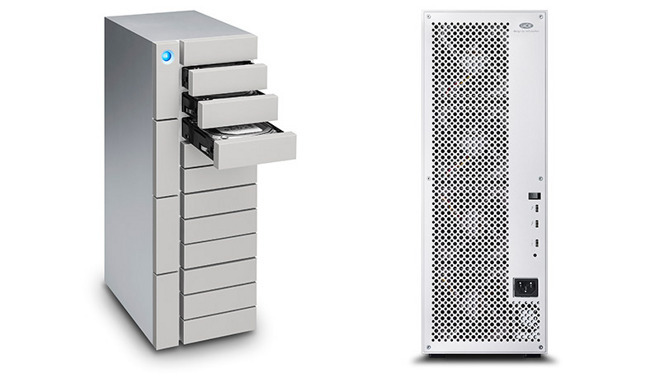 Promise was one of the first storage solution providers to support Thunderbolt 2 with the Pegasus2 RAID array, which AppleInsider reviewed in 2014. The firm's Pegasus3 and SANLink3 lineups are expected to ship in summer. Pricing has not been announced. Announced last year, the Thunderbolt 3 specification swaps out the old Mini DisplayPort connector for the reversible USB-C standard, while at the same time doubling throughput over Thunderbolt 2. Depending on the cable (and connected computer), transfer speeds can hit at 20Gbps with a standard USB-C cable and top out at 40Gbps with active copper USB-C or fiber optic plugs. Apple codeveloped the original Lightning interface with Intel and was the first OEM to introduce the standard on a shipping computer with 2011's MacBook Pro. Current Macs support Thunderbolt 2, though Thunderbolt 3 has yet to show up on a shipping Apple device. The company is expected to include the technology in future Mac products, and the company is already planning to make the switch over to USB-C, as evidenced by the 12-inch MacBook.